LuaGravity is a reactive language that implements the synchronous approach for concurrency. It is roughly based on Esterel and FrTime, two synchronous reactive languages, the former having an imperative style, the latter being functional. For an introductory video about LuaGravity, click here. 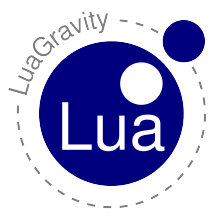 LuaGravity is implemented as a set of runtime extensions to the Lua language. It provides a pure Lua API library with the reactive kernel, and also an extra module with the meta language that is less verbose to use, and is built entirely with the kernel API. Reactors run implicitly, always as a consequence of a change in the environment. The execution of reactors is atomic and conceptually instantaneous. Reactors are themselves events, and can be linked to each other so that a reactor termination triggers its dependent reactors. This eliminates the need to explicitly declare and post events. Conventional events, represented as strings, can still be used when appropriate. Reactors are allowed to suspend in the middle of their execution (keeping local state) to wait for other reactors to terminate. This feature permits sequential execution for reactors, while keeping their reactive nature. Spawn and kill other reactors. Activate and deactivate other reactors. Create and destroy links between reactors. The link and await primitives are the supported reactivity mechanisms of LuaGravity. We define two reactors rA and rB, linking the string event 'eA' to rA. This way, rA executes and prints 'a1' whenever 'eA' is triggered, due to the link between them. Then, rA awaits the execution of rB. When rB is executed somewhere, it prints 'b' and awakes rA, which now prints 'a2'. As the example shows, string events or reactors can be used as conditions in links and await calls. Reactors executes implicitly, as consequence of links; or explicitly, as shown further. In LuaGravity, a program is a dynamic dependency graph of reactors waiting for external changes to react. In the graph, nodes are reactors with dependency relations represented by directed edges connecting them. The scheduling policy of reactors is determined only by the dependency graph, leading to what we call a reactive scheduler. Starting from an external stimulus, the scheduler traverses the graph running all dependent reactors until it reaches "leaf" reactors. We call this process a full propagation chain, which takes an infinitesimal time to complete. A full propagation chain is also our definition for an instant within the notion of discrete time of synchronous languages. Link edges: Created by link(X,Y) calls. The edge connects the reactor X (source reactor) to Y (destiny reactor) so that when the source reactor terminates successfully, the destiny reactor is implicitly triggered. Await edges: Created by await(X) calls. The edge connects X (reactor to await) to the continuation of the reactor being suspended. Await edges are temporary, as the scheduler removes them as soon as the suspended reactor is awakened. In both cases, the parameter X can also be a string event. In the dependency graph for introductory example the sub-nodes 1 and 2 represent the code chunks of reactor rC separated by the call to await. Reactors may be explicitly spawned from inside other reactors. The spawn(r) primitive acts like a fork, instantaneously scheduling the reactor passed as parameter and the continuation of the calling reactor to run concurrently. The execution of reactor rA prints 'a1' and spawns the reactor rB (chunk A1). The call to spawn immediately schedules rB and the continuation of rA (chunk A2) to execute concurrently. The scheduler chooses non-deterministically which one to execute first. When chunk A2 is executed, it prints 'a2' and awaits the termination of rB, creating a temporary await edge from rB to the last continuation of rA (chunk A3). When rB is spawned, it prints 'b1' and awaits rC, creating the temporary edge from rC to the continuation of rB (chunk B2). The execution of rC awakes rB, which, in turn, awakes rA, and both temporary edges are destroyed. LuaGravity is single threaded, meaning that any concurrent reactor runs atomically. This way, there are no critical regions in programs and, hence, no need for a locking mechanism. As reactors run as consequence of changes (input events) in the environment, LuaGravity applications must have access to such events. Each environment, which is defined independently from LuaGravity, must document its available input events and also output primitives. In the loop execution model, LuaGravity takes control of the environment, requesting new events from it whenever the applications becomes idle. The luagravity.loop call receives the application (main reactor) to run, and a function provided by the environment to requests new events. luagravity.loop only returns when the application terminates. In the step execution model, the environment takes control of LuaGravity, issuing steps in the application whenever new events are available. The luagravity.start call receives the application to run, starts it, and returns an opaque identifier to be used by the step function. The luagravity.step call receives the application identifier, the event to trigger, and a value associated with the event. A step returns once the full propagation chain reacting to the issued event terminates, what should take an infinitesimal time. The step model permits that several LuaGravity applications coexist, as it does not block. We try to separate LuaGravity itself from the environments in which it is used. This decoupling eases the adaptation of the language to different realms. For instance, when programming games, the environment typically provides input events for key presses and collisions between sprites, and ways to draw graphical primitives on screen. In a robotics environment, input comes from reading sensors, and output from commanding on actuators; and so on. Another reason to separate the language kernel from environments is that LuaGravity is implemented in pure Lua, while environments usually require a C module to interact with the operating system and, hence, are not portable. We chose to write the LuaGravity kernel as an API supporting every possible mechanism in the language. Above it, we provide a layer extending Lua with the semantics of LuaGravity. This approach follows the usual idea in the Lua world of separating mechanism from policy. We recommend programmers to use the meta module instead of the raw API. The current version of LuaGravity is 0.6.1 and can be downloaded here. I also keep a github repository here. This work is the result of my period at PUC-Rio as an MSc student supervised by Prof. Roberto Ierusalimschy. The MSc dissertation can be found here. The academic paper presented at SBLP'09 can be found here. I also maintain a weblog on reactive languages at http://thesynchronousblog.wordpress.com/. Please contact me if you are using LuaGravity. Also, feel free to ask me for help on how to implement new environments for the language. LuaGravity is free software: it can be used for any purpose, including commercial purposes, at absolutely no cost. No paperwork, no royalties, no GNU-like "copyleft" restrictions, either. LuaGravity is certified Open Source software. Its licenses are compatible with GPL. Starts the main reactor representing the application. Performs an execution step in the application with the given event. Runs the given application to completion. Creates a new reactor from a function body. Spawns the execution of the given reactor, passing a parameter. Executes the given reactor passing a parameter, awaiting its termination. Terminates the execution of the given reactor, cancelling it. Creates a link between src and dst. Breaks the link between src and dst. Makes the running reactor await for any condition passed as parameter. Deactivates the awaiting reactor passed as parameter. Reactivates the reactor passed as parameter. Terminates the running reactor, cancelling it. Makes the running reactor await for any condition passed as parameter. Further actions in the running reactor are not executed until it is awakened. Conditions might be the termination of reactors or posting of string events. A number may also be passed as parameter to make the running reactor await this number of milliseconds. The call returns the return value of the reactor responsible for awaking the suspended reactor. ...: [reactors|strings|numbers] Conditions to await. ret: [any] The return value of the satisfied condition.